This new and very detailed image of the famous circumstellar disk around the southern star Beta Pictoris was obtained with the ESO ADONIS adaptive optics system at the 3.6-m telescope and the Observatoire de Grenoble coronograph. It shows (in false colours) the scattered light at wavelength 1.25 micron (J band) and is one of the best images of this interesting feature obtained so far. It has a direct bearing on the current search for extra-solar planetary systems, one of the most challenging astronomical activities. 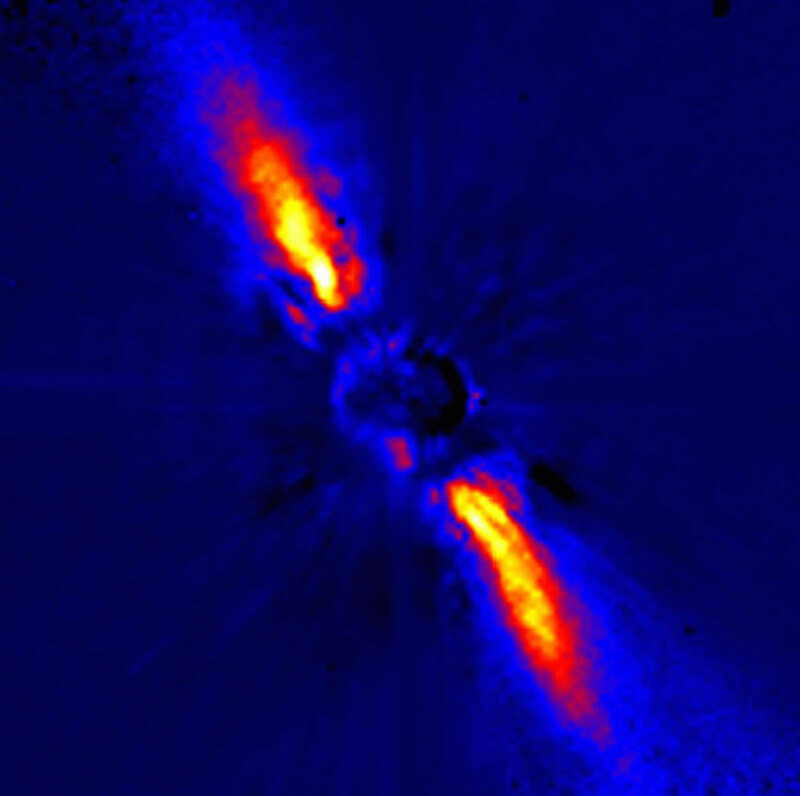 While spectroscopic, astrometric and photometric studies may only provide indirect evidence for planets around other stars, coronographic images like this one in principle enable astronomers to detect dusty disks directly. This is very important for our understanding of the physics of planetary formation and evolution. The disk around Beta Pictoris is probably connected with a planetary system. In particular, various independent observations have led to the conclusion that comets are present around this star, and variability of its intensity has been tentatively attributed to the occultation (partial eclipse) by an orbiting planet. The new image was obtained by combining coronography (in which the light from the star is greatly weakened by covering its image with a small disk at the focus of the telescope) with the technique of high-angular resolution by means of adaptive optics which nearly eliminate the adverse effect of the turbulence in the terrestrial atmosphere. This results in a very sharp image with a high spatial resolution (0.12 arcsec) and a high dynamical range (10 5) which allows to follow the disk to a very small distance from the star, in this case only 24 AU (3.6 10 9 km), i.e. a distance where planets could be present. In the Solar System, this corresponds to a distance from the Sun to about halfway between Uranus and Neptune. Although no planets are directly seen in this image, their gravitational effects on the dust in the circumstellar disk may be detected. For instance, it is evident that there is a warp (bending of the main plane) in the inner part of the disk, a feature that has earlier been seen on images obtained with the Hubble Space Telescope. However, while the HST picture was obtained in visual light, this image is at a longer wavelength, in near-infrared. Moreover, in view of the extensive image processing procedures involved in the preparation of this image, it is very useful to obtain this corroborating information from two entirely independent instruments. The warped feature may be explained by the presence of a planet moving along an inclined orbit (3 o) within 20 AU (3 10 9 km) of the star. The image was obtained by Jean-Luc Beuzit, Anne-Marie Lagrange (Observatoire de Grenoble, France) and David Mouillet (Observatoire de Paris-Meudon, France). In addition, the interpretation and discussion about the implications of planetary perturbations of the disk involved J. Larwood and J. Papaloizou. This study is described extensively in a forthcoming scientific paper in the journal Monthly Notices of the Royal Astronomical Society (UK). Technical information : The J-band image covers an area of 13.1 x 13.1 arcsec 2 at an angular resolution of about 0.12 arcsec. North is up and East is left. It was obtained on Jan 6, 1996, with ADONIS and the Observatoire de Grenoble coronograph, attached to the ESO 3.6-m telescope at La Silla, Chile.